A project presented by FAUX with limited edition collection of plates by Hong Kong based artists Fung Ming Chip, Wilson Shieh, Angela Su, Tsang Kin Wah and Richard Winkworth and Macau based Konstantin Bessmertny. Each artist has created a unique design for a 12 inch diameter plate, boxed in sets of 4 in edition of 50 sets. 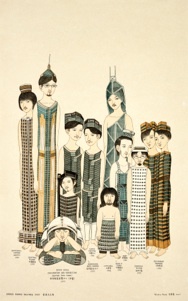 －A new Chinese autobiography written and illustrated by Wilson Shieh. Published by Joint Publishing Hong Kong, Dec 2015. ☛ I showed a set of Decor screens according to the seven important places Dr Sun Yat-sen stayed during his life. ☛ I showed a set of Architecture series painting on silk (2007). ☛ I showed a set of gongbi painting “Teresa Teng in Four Seasons”. ☛ I showed a set of gongbi painting “Angkor Quartet”. ☛ I will show a set of 4 pieces gongbi painting “Chinese Music Instrument Bodies” dated 2003 from the Ashmolean collection.